The famous Artists’ Quarter in the Old City of Safed (pronounced “Tzfat” by the locals) is one of the many treasures belonging to the Upper Galilee. The rich history, holy importance and buzzing art industry makes the Artists’ Quarter a must-see when traveling in Israel. 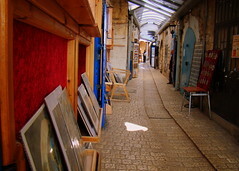 The narrow, winding stone streets and the sturdy stone buildings date back to Safed’s restoration in the 16th century. Today, the streets are lined with collective and private art galleries and workshops featuring oil and watercolour paintings, silverwork, jewelry, glasswork, weaving and artistic Judaica. Found in the mystical Old City of Safed, hugged by the ancient Jewish Quarter and the large Ottoman-era buildings on the Southern plateau of Safed, the Artists’ Quarter is often the first and foremost on travel itineraries. Visitors can stroll down Bet Yosef Street, popping in and out of the numerous galleries and workshops where artists spend their days immersed in their work. Watch painters as they transform a canvas into something magical – and purchasable! Other artists sculpt and weave, even micro-calligraphy – art of tiny letters, often a sacred text – can been seen. Some of the artists engage in Kabbalah and incorporate Kabbalistic symbolism in their artwork. At the entrance to Safed’s Artists’ Quarter are several larger collective art galleries, including the Olive Tree Gallery and the Soul Art Gallery – each featuring dozens of artworks on canvas, silver and glass. These galleries offer shipping to make your travels easier. Private art galleries and workshops are more intimate way to get a truer glimpse of the artists and their work. One of the most interesting workshops is the Canaan Gallery where locals have re-infused Safed’s traditional loom-weaving of the Spanish settlers with vibrant new yarns making tallits (prayer shawls) and scarves for all to see. At the far end of the Safed Artists’ Quarter, bordering the ancient Jewish Quarter, is the Tourist Board where maps and pamphlets can be picked up. Also in the Tourist Board is a short 10-minute video called “History of Safed” offered in Hebrew, English and French. Below the audio-video presentation room are excavations delving into the remains of the city that existed before the “renewal” in the early 16th century. Across the Tourist Board is one of the most memorable restaurants in Safed, the Lahuhe Original Yemenite restaurant where authentic Yemenite bread (lahuhe) is served pan-fried with local cheeses, vegetables and spicy schug. For those looking to eat baked goods, pizza or the classic Israeli falafel and schwarma, a short walk up the stairs leads out to Jerusalem Road – a street lined with shops, restaurants and bakeries all still within the magical bubble of mystical Safed.